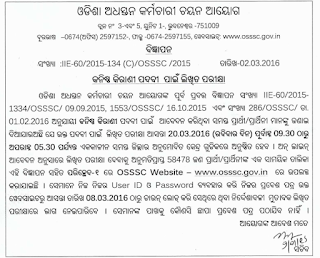 Odisha Sub-Ordinate Staff Selection Commission (OSSSC) is going to conduct skill test for Junior Clerk posts. The Computer Skill Test is scheduled to be held on 18 September 2016. Earlier Odisha Sub-Ordinate Staff Selection Commission had completed the process of getting applications for these posts in district ministerial and Clerk services. The written exam result was declared recently. Now the admit cards are released for shortlisted candidates. The Admit card of OSSSC Junior Clerk Skill test had been released now. Shortlisted candidates can download OSSSC Junior Clerk Exam Admit card from below. OSSSC is going to conduct Computer Skill Test on 18 September 2016 for Junior Clerk posts. For that, admit card are available for download now and candidates can get them by entering their 9 digit roll no.. Candidates have to download OSSSC Junior Clerk admit cards from the official website osssc.gov.in via the direct link below. All the important details like exam venue, roll number, date and time etc. had been mentioned in them. Earlier Odisha Sub-Ordinate Staff Selection Commission had invited applications for Junior Clerk posts. Now the skill test is to be held as a part of the selection process. OSSSC admit card for Junior Steno is available now. The candidates can download their admit card from OSSSC website osssc.gov.in via the link given here. In order to download the admit card for OSSSC Junior Clerk exam, candidates need to visit the direct link provided here (after release). It will take you directly to download page. Then candidates need to submit their user id and password. 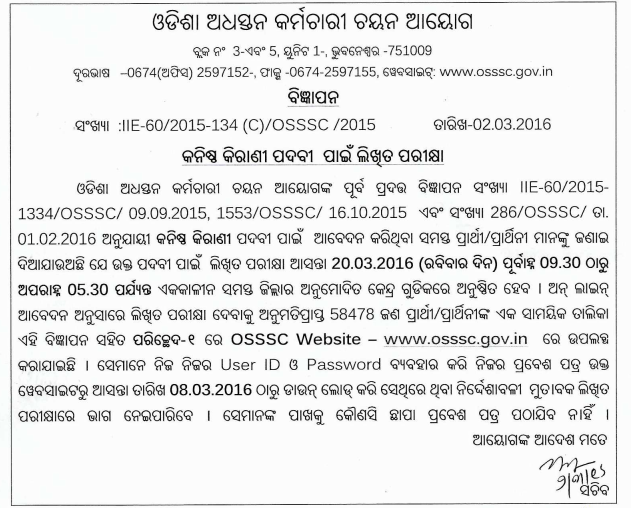 Their OSSSC Junior Clerk Admit card 2016 will be shown to them. candidates have to take a printout.